BioTech Professional Spray Nozzle has an extra long trigger provide unsurpassed comfort. With 30-40% greater than standard trigger sprayers. BioTech Professional Spray Nozzle has an extra long trigger provide unsurpassed comfort. With 30-40% greater than standard trigger sprayers. BioTech Professional Spray Nozzle has an extra long trigger provide unsurpassed comfort. With 30-40% greater than standard trigger sprayers. Our Can Gun For Aerosols is designed to grip standard aerosol cans, the can gun spray can tool gives you an easy and comfortable way to spray. The Air Gun includes a mar-free rubber 4" nozzle, for blowing out hard-to-reach areas Grit Guard is one of the best car washing solutions that protect your vehicle from particles and dirt in the washing buket. 5 Gallon Pail dispensing pumps release approximately 1 oz. for every pump. This durable pump can be washed and reused The Air Gun w/Flex Tube is perfect for blowing out air vents, consoles and other hard to reach areas. Heavy duty, industrial, high pressure spray gun nozzle. Leakproof. Overall length approx. 6 in. Pump Sprayer - Very Convenient, easy to use hand held pump sprayer. Hand-held sprayer is ideal for variety of jobs. 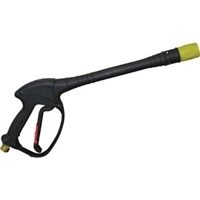 The Fireman Style Hose Nozzle is an adjustable spray style nozzle with comfort grip. This sturdy, polyethylene siphon drum pump works with 15, 30 and 55-gallon drums. Is effective and fast. Spray Gun 12" Aluminium- Pressure Pro Foam Cannon with Hose Nozzle has sturdy 32-ounce reservoir housing for diluting any soap or cleaner of your choice. Reservoir is also graded to help with diluting your soaps and cleaner. The amazing benefit of using foam cannons to deliver the soap to the vehicle is that it doesn't require you to touch the vehicle at all, which could rub dirt against the paint. Foam Cannon with Hose Nozzle has sturdy 32-ounce reservoir housing for diluting any soap or cleaner of your choice. The amazing benefit of using foam cannons to deliver the soap to the vehicle is that it doesn't require you to touch the vehicle at all.. The Sensitive alternative for aerosols! Our Cleaning tool cleans engines, door frames, upholstery, interior plastics and more. Our Cleaning tool cleans engines, door frames, upholstery, interior plastics and more. These tornado tool includes a metal hose for stronger and better reach.